Today's Barn Chicks who Blog interview is with Ott, A from the blog, a Latte' with Ott, A. I like Ott, A and her husband, Ott, E. Even if their blog names make me think of Dr. Seuss. I like the rhyme in her blog title too. After all, I'm the one who's forever making up crazy rhymes. Ott A and her hubby are really into food, so we found that we have this in common a while back. How do Chocolate Peanut Butter Swirl Cheesecake Bars sound? I'm sure she probably whipped them up with that red Kitchen Aid Stand Mixer that she poses with in pictures! I understand the importance of a photo like that. I'm emotionally attached to my two Kitchen Aid Mixers. So... enjoy the interview. Well let me first tell you a little bit about my background. 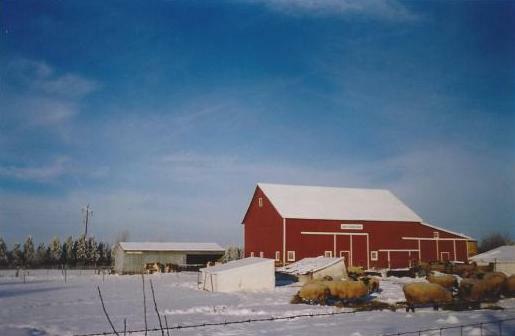 My families' farms are located in north central Indiana where I was born and raised. They grew corn and soybeans, sheep and cattle on these farms and most weekends and school vacations you could find me at their farms helping bale hay, sort lambs or doing whatever other seasonal chores needed done. I always enjoyed working with the livestock. When my brother and I went off to college my grandparents realized they were getting older and started to change some of their farming operations. The land is now cash rented and they reduced the size of their flock from about 100 head of sheep to 20, and they sold all their cattle. Even though I am now married and live about 100 miles away from the farm, I still enjoy going up there on the weekends and seeing all the animals. My husband and I have been married for 2 ½ years and own a house in the county with a large yard and we enjoy gardening and cooking and preserving what we grow. 2. What kind of animals do you have? The family farm still has purebred Shropshire Sheep, all of which are registered and have bloodlines that date back to 1919. We also have a few chickens and barn cats. And like I mentioned earlier, up until a few years ago we had Simmental Cattle as well. We would show our animals at the county fair as well as the state fair and various other open shows around the state. We even went to Louisville, Kentucky to the North American International Livestock Exposition in 1996 and 1998. 3. How do the animals get named? All of our animals have eartags with numbers that identify who they are and this helps us to keep accurate records for our breeding programs. However most of our show stock received names which was helpful in referring to them since they received a little more love and attention than the others. Our names ranged from what was popular at the time to names we thought were cute and cleaver. Sometimes we would name them after the people we bought breeding stock off of, and sometimes we would combine their parent’s names and get something new. 4. Does your husband come from a farm background? My husband, (Ott, E) grew up in Wisconsin and his grandparents milked cows, while his parents owned a hog farm (farrow to finish) for a few years. We met at Purdue University where we both graduated with degrees from the college of Agriculture. He with a B.S. in Agronomy and a M.S. in Weed Science and me with a B.S. in Animal Science. Ott, E now does research on herbicides and pesticides for an Agri-Chemical Company. He travels the mid-west and sets up trials in corn and soybean fields. 5. I understand you and your husband like to cook together. What are some of your favorite things to cook? We do, in fact Ott, E says that’s “our thing.” We like to try new things and new foods. Like making our own pasta, or Eggplant Parmesan. Ott, E likes to grill and he is the chief pancake maker at our house on Saturdays for breakfast. Right now we are on a cheese kick. About once a month we buy a unique kind of cheese and cube it up and have it with some wine as an appetizer. And for a fun New Years Resolution we are traveling the state of Indiana in search of the best breaded pork tenderloin. Breaded Tenderloins are somewhat of an Indiana thing and we stop in at little mom and pop restaurants that make them and then blog about how it tasted. 6. Do you plant a big garden? We plant a garden big enough for two people to eat off of and still have enough to put up and preserve. We plant tomatoes, potatoes, onions, lettuce, green beans, egg plants, zucchini, spinach and kola rabi. I’m always surprised by how many people don’t know what kola rabi is so I included a picture. (We make a great casserole with it.) Gardening is a hobby, we both enjoy. I also like to plants lots of flowers in my garden and around our yard as well. I love sunflowers and plant tulips, daffodils, iris’s, and lots of summer annuals in flower pots. 7. I see lots of posts about canning. Did you grow up in a home with canning, or is this something you've learned as an adult? Yes, I enjoy canning what we raise in our garden. I can Green Beans, Tomato Juice, Salsa, Potatoes, Apples, Apple Butter, Apple Pie filling, etc. My mother and grandmother both canned all while I was growing up. At first I got the job of snapping the green beans but then as I got older I moved into the kitchen and started helping process the jars. I even entered some in the local 4-H fair back in the day. So naturally when we got married the first thing I registered for was my own pressure cooker and jars. It’s a hobby, but it also brings me great satisfaction to enjoy the fruits of our labor all year long rather than just in the summer when things are ripe in the garden. I’ve noticed a lot of people are unfamiliar or skeptical about canning, but it’s really easy and I try to blog step-by-step instructions on how I do it so others can be more educated on it and give it a try. 8. Tell us about some of your other favorite hobbies. Ott, E and I like to travel and he keeps track of every county we have been to in the US together on a map. Last summer we went to Alaska and it was beautiful up there. And Ott, E enjoys photography. He takes lots of picutres of nature, landscapes and the countryside. As for me, like most girls I like to shop, and have a weakness for shoes and purses. I also enjoy decorating our home, painting the walls and changing out decorations for the seasons. I collect Longaberger Baskets and scrapbook whenever I find the time. Ott, E and Ott, A at Mt. McKinley in Denali National Park, Alaska. 9. What's your favorite thing about living in the country? The peace and quiet! I work in downtown Indianapolis and nothing beats coming home to our house where the only noise is a bird chirping. I like to sit on my patio and watch the sun set as I read the evening paper. I like the country because I can plant things in the ground and watch them grow and go walking around barefoot in my front yard in the summer and take pictures of the snow clinging to trees in that same yard in the winter. I also really like small rural towns. Both my husband and I grew up in them and nothing beats walking down the street and knowing over half the people you see, or attending a small town festival where the whole town comes out to watch the parade go by. 10. What made you start blogging? I had a blog for work The Ag Grant Guru, and enjoyed doing that. It is a resource for finding, applying and managing grant funds. After a while (and with some urging by co-workers) I started a personal blog. At first I thought it would be a great way to let family and friends know what we were up to. But then one day I realized blogging is a great way to tell others about how their food is produced. We all eat food, and depend on the places we buy our food but do you know how the food got to the grocery store you shop at. I enjoying sharing what I know about agriculture and food production with others and that’s why I blog about the family farm and how we take care of our animals and hope it will better educate consumers on agricultural practices. 11. 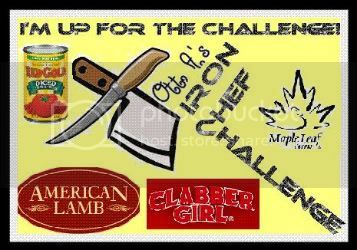 What is your Iron Chef Challenge? The Iron Chef Challenge is a monthly recipe linky party to get bloggers to try new foods. Just like the TV show; every month there is a themed ingredient, guest judge and prize for the winning recipe and blog post. Bloggers use the themed ingredient in a recipe and then post about it on their own blogs and link up to the contest on my blog. During the week of the contest I do blog posts about the company who sponsors the contest and describe where they are located, how it got started and how they grow or process their products. Any blogger can link up a recipe and join in the fun. So far we had Duck, Lamb, and canned tomatoes, and in the future we will have baking powder, yeast, ham, and flour. Well , Ott, E and I hope to buy 5-10 acres here is a couple of years and have a barn with some livestock of our own and a really big garden. Ott, E and I would like to raise enough produce to be able to sell some at the local Farmers Market. We plan on continuing to both work in the Ag industry and keep telling the story of how efficient American Farmers are. I really enjoy these interviews. It's good to get to know some American farmers more personally. In our house, we are most supportive of the American farmer and do not buy products not farmed right here in the US. I use the Cornucopia Institute for this. Is there a better site for this information or is it thorough enough? Thanks for featuring me on your blog today. 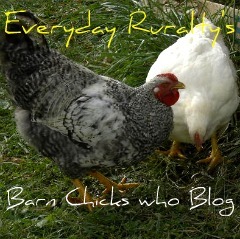 I am honored to be apart of the "barn chicks who blog." We kitchen aid stand mixer enthusiast need to stick together!!! I'm one of those canning sissies but this is inspiring. Thanks for sharing a slice of your life. I really enjoy these! 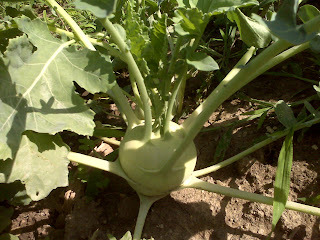 oh, i love kohlrabi - not cooked but raw! just peel, salt and eat!!! it was always one of the first things we could get out of the garden in wisconsin. YUM! i've only seen it in a grocery store down here in dallas once! i was practically dancing in the aisles! i tried to grow it once but our temps are just too intense. It makes me so happy to see younger girls returning to the farms and growing and canning and all of the things that I have thought I was a dinosaur about. Nice post. I'm with texwisgirl; I like my Kohlrabi raw, maybe with a little salt! Great interview! Thanks for helping farmers share our stories! I checked out the Ott blog and had to get out of there fast!!! Oh my gosh... all the great food she makes made me want to eat. Once again a great interview. Nice to read about others who like kohlrabi! Ott, A is a fellow Hoosier and I love following her blog. Great interview!